January 15, 2017 (by Jimmy) – In one of our last few posts, we received a comment asking advice about travelling. That got me to thinking. We normally provide you with what we are doing on a daily basis as an indication of what we do. What I’d like to do now is provide some background on how we decide where we are going, how long we are going to stay, and some general rules of thumb that we have developed since we have been full time in the RV. Now, here’s the disclaimer. What works for us may not work for you. Our lifestyle is built around where my next job may be, when it starts, and even whether or not we will be moving the RV to the client site. If you are retired or don’t travel around your job opportunities, some of this may not apply to you. How do I determine where my next job will be? First, I’m a consultant; I put computer systems in hospitals. Since our travel is based around where I am going to work, this is an excellent question. I work with a number of recruiters and consulting firms to line up projects. My projects normally run from a full install (like in Corinth, MS) lasting a year or more to an assessment and correction, which will last a few months, to a training that will last a week or two. It really depends on who has what project when I come off my current project. Sometimes, I’ll get competing contracts, and then I must evaluate them as to length, location, and project requirements. The bottom line is I only have limited ability to determine where I am going to go, but I do have the ability to say no (that’s the big positive about being a contractor). Do I ever take a project and not move the RV to the client site? Oh, yes. My first two projects while in the RV were in Steamboat Springs, CO and Brockton, MA during Jan and Feb, respectively. I parked Angela on the Gulf Coast and flew to the client site. The intent when we started living in the RV was to be together on the road, so I don’t take those projects often, and never longer than 3 months; however, if the project is right or will lead to another project (the Brockton project led to the Corinth project – same firm), then I will consider them. Our main focus, though, is in going to the client site together. When on the road, what is our limit for daily travel? The short answer is 250 miles. 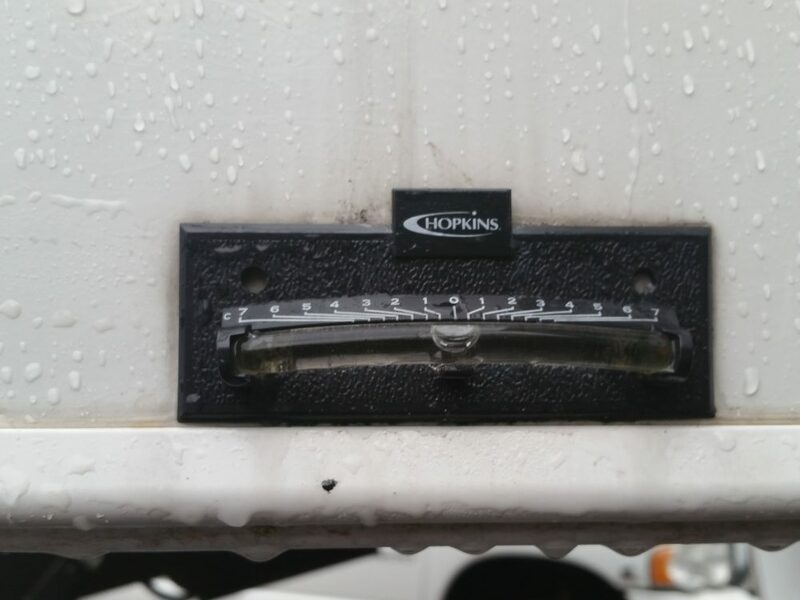 Angela and I calculate that it takes about two hours to get up, have a cup of coffee, prep the RV for traveling, unhook from the lot, hook up to the truck, check tire pressure, and, in general, get ready to leave. On the other end, it takes about two hours to check in, unhook from the truck, and get set-up at the new camp. When we travel, we normally travel at 55 – 65 miles an hour depending on the road. I never drive the RV over 65: this is our house and a blow-out would not be good. With stops for lunch, gas, etc., we calculate that we average about 50 miles an hour. That makes two hours to break camp, 5 hours on the road, and two hours to set-up camp a 9-hour day. That is a full day. Our longest trip was 390 miles in one day; that was way too tiring. What sequence do we go through to set-up at a new site? 1. 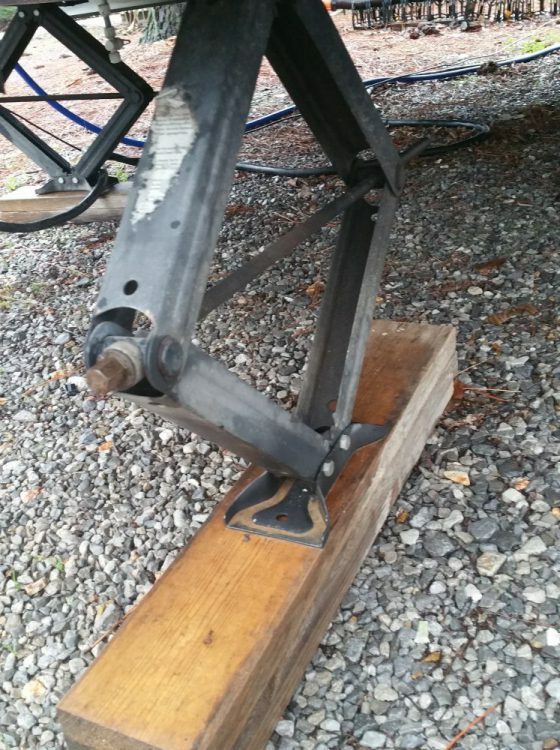 Level, chock, and stabilize the RV – We have two levels stuck to the RV: One levels side-to-side the other levels front to back. We pull into the site and get the fifth wheel where we want it to be (making sure all slides have room to push out without hitting anything). Then we look at the side-to-side level. 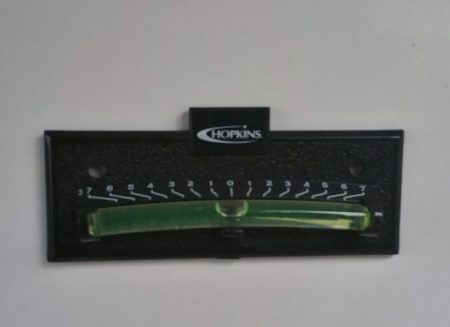 If it is 1 degree or more off center, we get boards to put under the low side, back the RV up, and then pull it up on the boards to level. Most of the time, we get it first shot, but sometimes it takes multiple tries to get side-to-side level. We then chock the wheels. 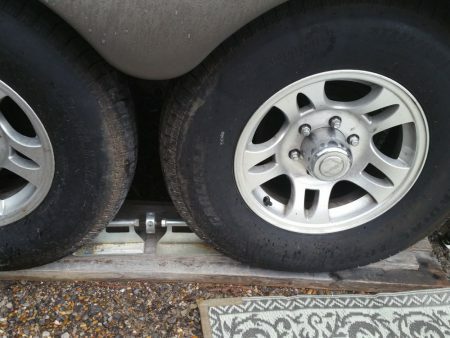 We use metal chocks that sit on the ground and expands to grab the tires and keep them from moving. We then drop the front feet (landing legs) and level front to back. Lastly, we drop the back stabilizers. 2. 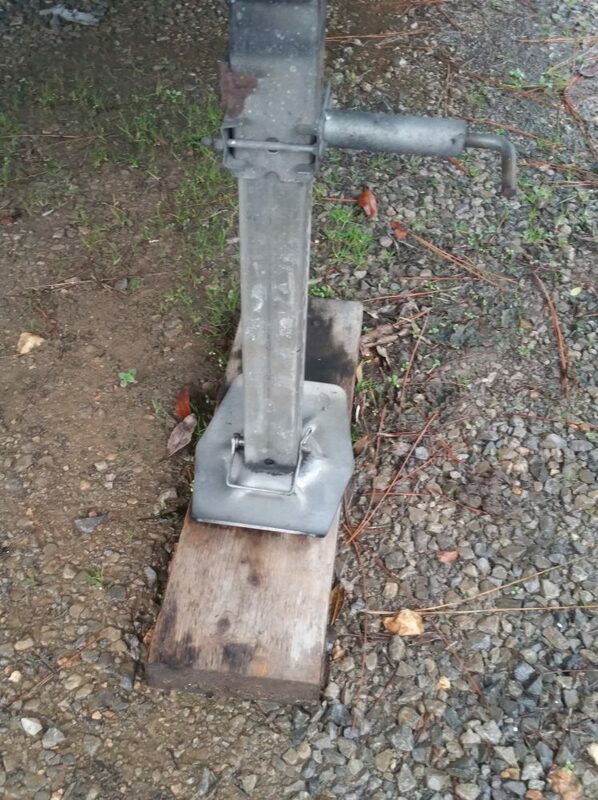 Hook-up electric, water, and then sewer – Our electric is 50 amp, so we normally set up a campsite that has 50 amp. There have been times that we have been to campgrounds that only had 30 amp available, so we have an adapter for 30 amp. 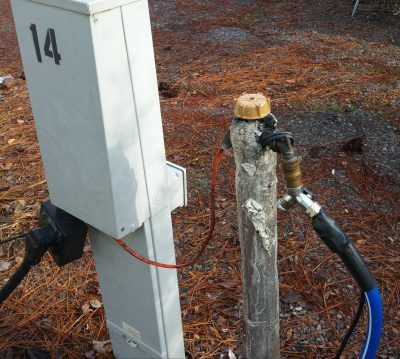 For water, we have a heated hose, but we don’t plug it in unless it will be getting close to freezing. We also have a pressure regulator that limits the amount of water coming through the hose. This is needed to keep from having a surge that will damage the plumbing. We also have a water filter and an elbow. 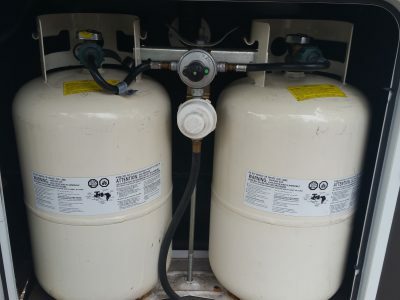 The filter to remove impurities from the water, and the elbow keeps the hose from sticking out of the RV and damaging the intake water plug of the RV. Finally, for the sewer, we have a slide that allows the hose to slope down to the sewer dump. We use this because we don’t want any of the water drained out of the RV sewer to stagnate in the pipe because it’s laying on the ground. 3. Turn on everything, pull out the slides, and un-bungee items inside – With the RV level and stabilized and the power and water hooked up, we can now go in and open the house. First, we turn on the propane. That way if there is a leak, we will smell it as we are normalizing the rest of the RV. 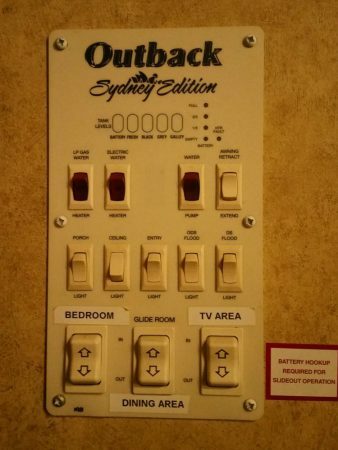 We then push out the slides, bedroom first. I normally stand outside to make sure the slides don’t hit anything, and Angela pushes the button to move them out. Next, we push out the dining area and finally, the TV area. We do the TV area last because there are cabinet doors behind it when pulled in, and we want to make sure they are still closed when we push out that slide. (This was a lesson learned early on.) I read somewhere that an RV going down the road will produce a shaking in the realm of a 6.9 earthquake. 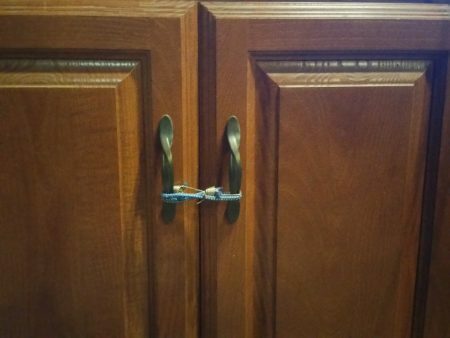 So, we bungee all the cabinets, put tension rods in the refrigerator to keep things from falling off the shelf, and put breakable things in boxes to separate them from each other, etc. Let’s face it – a 6.9 earthquake for 5 hours can move things around. The final thing we do is un-bungee the cabinets. What about dumping tanks? We have three tanks. First, is the black tank (or toilet tank) that everyone has a story about or has seen in the movies. The second is the galley tank, which contains sink water from washing dishes, and the third is the gray tank for shower water. We have found that it takes about a week to fill the black and galley tanks and about 4 days to fill the gray tank (with normal use). We try to dump our tanks about once a week. Here’s how that is done. We leave the gray tank open until about four days before we are to dump tanks. We then close the gray tank to let it fill for dump day. On dump day, we open the black tank first. We have a hose connection that allows us to spray down the inside of the black tank,and we use that about every other, or at least every third, time we dump the black tank. Once the black tank is dumped, we close it up and open the galley. This tank has soapy water, but also food remnants that need to be removed. Once the galley is dumped, we close it and open the gray tank. Now the gray tank is pretty much soapy water, so it not only empty’s the tank but also washes the sewer tube of any residual black and galley material. Once open, we leave the gray tank open until four days before our next dump. We do dump all of our tanks when we move from place to place if we’ve been there two days or more. How do we determine how long we are going to stay at one place? If we are moving to a client site, we normally determine how far it is to the client site and make sure we get there two days before starting work. For instance, if I start work on a Monday we want to arrive on Saturday. We do this because if there is some issue on the road we have an additional day to arrive. If all goes well, we get a day to explore town before I start work. If we are not traveling to a client site, we look for somewhere to stay for a month (monthly rates are much less expensive). By staying somewhere for a month, we get to explore the area thoroughly. On the way there, we try to stay two or three days in each place we stop. As far as where we go, we determine that based on what time of the year and how much open time I have between clients (or think we have). 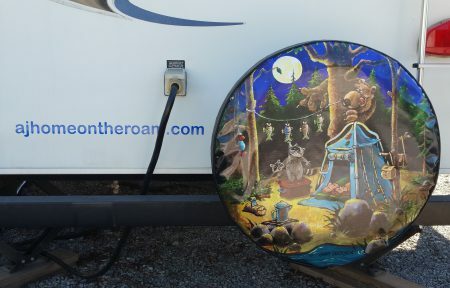 Do we always stay in an RV park? When we are on client site, yes. When we are traveling, no. We are members of Harvest Hosts and are looking forward to boondocking on BLM land when we head out west. Currently, I’d say about 95% of our travels have been in RV parks. Isn’t staying in RV parks expensive? Most of the time when we travel, we try to stay somewhere for a month. Normally, a monthly stay will run $400-$500, but that also depends on where you want to stay. The two or three day stays when we are on the move usually run $100, plus or minus. So, when we are on the road, we normally see a camping bill of around $700 per month (a few days to get to the monthly stay then the one-month rental), and that includes utilities. When I am on client site, my monthly lot rent and utilities are paid by the client (another perk of being a consultant). If I were traveling consistently, I would try to limit my stays at RV parks, not because of the cost, but because staying in other venues would add flavor to the traveling. Site rent of $500 a month somewhere is not really all that expensive when you consider that an apartment would be at least twice that amount.